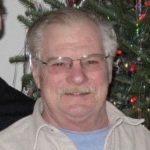 Harold John Donnini, 71, of Tunkhannock, passed away peacefully on August 23, 2018 with his family by his side. Harold was born on February 17, 1947 to the late John Donnini and Margaret (Kittrick) Donnini of Wilkes, Barre, PA.
Harold was a sheet metal mechanic with Local Sheet Metal Union #44 and was employed by E. J. Rogan and Sons, Inc.
Harold was a Combat Navy Veteran of the Vietnam War, serving aboard the USS Truxtun. For his service for our country, he was awarded the Vietnam Service Medal, the Vietnam Campaign Medal, the National Defense Service Medal and the Navy Unit Commendation Ribbon. Harold is survived by his wife, the former Kathleen Rogan, Tunkhannock; sons Dylan, Tunkhannock; Sean and his wife Margaret; granddaughters Mabel and Claire, all of Columbia, Maryland; brother, Jim Donnini and his wife Julie, Hobbie, PA; and sister, Deborah Hummer and her husband Tom, Courtdale, PA; and numerous nieces and nephews. Friends and family are invited to a celebration of Harold’s life from 2:00 p.m. to 4:00 p.m. on Saturday, September 1, 2018 at Corcoran Funeral Home, Inc., 20 S. Main St., Plains, PA 18705. Interment will be held at the convenience of the family. Memorial contributions may be made to Celtic Hospice, 601 Wyoming Ave., Kingston, PA 18704, in Harold’s memory.